Each of our lovely cake designers brings something unique to the drawing board. All have an artistic background – either in costume design, art education, songwriting, sculpting, architecture, painting, and storybook illustrations. Their passions are fueled by creating beautiful things, and their minds and imaginations will leave you speechless. Often our brides will come to us undecided or with a general vision, and we will sketch out beautiful, one-of-a-kind works of art. How do I start? First, let’s schedule an appointment. Call or email with your availability and your choice of 4 cake flavors to try. When you arrive, you’ll be greeted with water and your samples as well as some photos of our work to browse. Consultations are free and typically last 30 minutes. You’re welcome to bring anyone to the consultation. Our home is your home, and we are excited you want to visit with us! 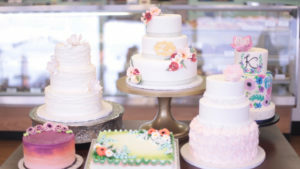 Our wedding cake prices start at $4.50 per serving. This can include classic, rustic buttercream textures, our famous “smooth as fondant” buttercream, simple buttercream piping details, buttercream flowers, and multiple flavors of your choice. Custom designs start at $5.50 per serving. This may include intricate lace patterns inspired from your gown, custom character toppers, show-stopping metallics, and more! The possibilities are endless. We also provide cupcakes, cookies, and pies to complete your dessert table needs. But we don’t stop there. We are artists that get excited about gravity-defying cakes, realistic 3D designs, and whatever your imagination you conjure up. We strongly encourage delivery of all wedding cakes. Who needs the hassle of picking up a fragile statement piece on your most important day? Let us do the work for you to ensure that your cake arrives on time and perfect. Our design specialist is available for in home consultations. Flavor samples will be provided, as well as faux cake visuals to aid in the design process. Please call Sarah for pricing 615-367-2355.